Current affair is one of the important sections of the IAS Prelims Exam syllabus. Study of current affairs requires a steady practice of the IAS questions based on the recent events of national and international importance. An aspirant should have the habit of reading a newspaper on a daily basis, one of the essential parts of IAS study plan, but they also required to practice current affairs quizzes based on the important events happened on those respective days. 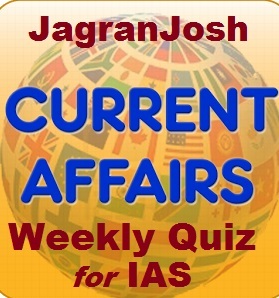 For the last few years, the importance of current affairs is increasing year by year and it requires a proper study plan to cover the important current affairs topics of the whole year.Current affair is not only essential for IAS Prelims Exam but it is simultaneously important for IAS Mains Exam also. So, there is not a little chance to ignore current affairs during IAS preparation. Here, we have started to provide a cumulative weekly article of current affairs quiz consist of all the articles created during the respective weekdays. IAS aspirants can take the most benefit out of it and it will help them to save their precious time. In this article we have covered the topics like- cashless India, e-cabinet, first National Women’s Parliament, Namami Ganga Programme, MoU between India and Senegal. In this article we have covered the topics like- Bohemian Waxwing a rarebird, 'Pradhan Mantri Gramin Digital Saksharta Abhiyan’, MoU with Senegal, BIMSTEC countrie meet and BioAsia. In this article we have covered the topics like- Central Pollution Control Board (CPCB), Juno spacecraft, Advance Prising Agreements, India and Italy MoU and Cold Start Doctrine. In this article we have covered the topics like- Act East Policy of India, BIMSTEC Senior Officials’ Meeting (SOM), Rashtriya Uchchatar Shiksha Abhiyan (RUSA), Universal Immunization Programme and Telecom Regulatory Authority of India (TRAI). In this article we have covered the topics like- Unique Identification Authority of India (UIDAI), India Innovation Index, Hague Convention, World Wetland Day and Regional Comprehensive Economic Partnership (RCEP). In this article we have covered the topics like- India Innovation Index, Mahila Shakti Kendra, International Solar Alliance (ISA), Payments Regulatory Board under RBI, and CRISPR technology. In this article we have covered the topics like- NABARD, Awareness for Livelihood Promotion programme (SANKALP), Centre’s negotiation committee on Mahanadi river water dispute, ASTROSAT, Credit Linked Subsidy Scheme (CLSS) and the lost continent.